Jody Jaffe waited 40 years for these boots. The Vogel boot showroom in lower Manhattan isn’t much bigger than a generous box stall. Three shelves line the front window, offering an assortment of Vogel footwear: dress boots, field boots, paddock boots, men’s shoes and, at the far right hand corner, a pair of hot red leather boots for when I win the lottery. But wait, I just did win the lottery of sorts. Nearby, in the back room on a high shelf are stacks of boxes labeled “Orphans.” At the bottom of one of the stacks are my dream boots, a pair of black field boots in obscenely soft leather, with zippers running up the back to allow easy entry for my pinned together ankle (thank you Hap the App for landing on my leg and severing both bones). They are almost a perfect fit. And almost is good enough in this case. Dean Vogel, the third generation of Vogels to make hunter/jumper riders look elegant in the show ring, offers up a small, rueful smile when he tells me free alterations are part of the orphan deal. “$1,500 boots for $450,” he says. Was that just a bit of a pained look on his face as he stroked the soft French calf leather? He’s wearing well-worn ankle boots he made himself years ago. “Kids in college,” he says, showing the same small smile as he explains why he’s not wearing newer shoes. Mistakes happen, boots are mis-measured and returned. Or sometimes an order is made twice. The end results are stacks of orphan boots looking for homes at one third their normal price. I’ve been circling around Vogels for 40 years, wistfully looking at them on the tall, skinny blondes at the horse shows like I used to wistfully look at the real LadyBug clothes on the rich kids at school. Even when I could’ve more easily afforded a custom pair of Vogels, I didn’t. It was an expense I couldn’t justify on a reporter’s salary. 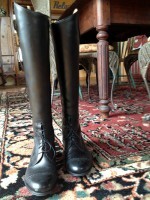 These boots were another dream in a long list of equine dreams that started before I could form words. My mother told me I kissed pictures of horses before I could even say horse. I don’t remember ever not longing for a horse, which, for a kid who lived on the top floor of a row house in Philadelphia, was about as realistic as longing to marry my favorite Beatle, John. I couldn’t do anything about John, especially since he was already married to Cynthia, and I was only 10, but I could do something about getting myself a horse. I opened a savings account at PSFS, and the bank officer handed me a passbook not much bigger than my iPhone. Each week I deposited a dime, and each week the teller stamped in a new total. Seven years later, at age 17, I left for college with my little blue passbook and a mission that had nothing to do with academics. Before my freshman year was over, I’d cashed out my life savings—$400—for Homer T. Horse, a skinny chestnut Thoroughbred with shark-fin withers blistered raw by ill- fitting saddles and a big, jug head that only a mother—or a besotted young woman—could love. There was no denying Homer was the ugliest horse in the ranch’s fleet of lesson horses. But to me, this ungainly gelding was Black Beauty, My Friend Flicka and Misty. He was all of them and more. Homer not only taught me to ride, but he also taught me that dreams could be realized with hard work and patience. The hard work was the easy part. I cleaned stalls to pay his board and scrimped everywhere I could to pay for lessons, which meant living in a basement with a dirt floor. It was the patience part I found challenging. You might think waiting seven years to finally buy a horse, or 40 years to finally get a pair of Vogel boots makes me a patient woman. Hardly. I can’t even begin to count the stupid horse (and life) decisions I’ve made because I couldn’t wait. My middle name should be Rash. Hap the App and my broken leg is just one example. Homer was very lame—severe navicular—and I wanted to ride. Instead of spending time looking for an appropriate horse, and against the advice of my riding buddies, I bought a big-bodied, pushy Appaloosa who used his bulk to intimidate people. When he wasn’t grabbing the bit and running away, he tried to scrape off his riders by ducking under the low branches of horse chestnut trees, the ones with the prickly fruit. But that sucker could jump from anywhere, which he did. He left out a stride down a line, and I flew off and under him. What made this decision especially stupid, and rash, is that I bought him not long after I’d returned from Outward Bound. I took that course 35 years ago, and the only things I remember are how bone-weary exhausted I was and a passage the leader read to us from Zorba The Greek. I’d been so moved, I vowed to let the lesson of the butterfly guide my life. “I remember one morning when I discovered a cocoon in the back of a tree just as a butterfly was making a hole in its case and preparing to come out. I waited awhile, but it was too long appearing and I was impatient. I bent over it and breathed on it to warm it. I warmed it as quickly as I could and the miracle began to happen before my eyes, faster than life. The case opened; the butterfly started slowly crawling out, and I shall never forget my horror when I saw how its wings were folded back and crumpled; the wretched butterfly tried with its whole trembling body to unfold them. Bending over it, I tried to help it with my breath, in vain. That butterfly was missing in action the day I bought Hap, as it has been many times throughout my life. And that’s one of the reasons I never indulged my whim to get a pair of Vogels. I’ve spent a lifetime rushing into decisions, leaving behind a slew of butterfly carcasses in my wake. I drew the line in the sand with the Vogels. I didn’t need them, I had other boots that looked good enough, and I certainly had better things to spend $1,500 on, such as lessons, shows and Adequan to keep the horse of my dreams lubed up. However, when my husband and I went to New York City to visit our son a couple months ago, I asked if he’d mind if we went to the Vogel showroom. If you will recall from other columns, he’s been dubbed The Saint by the hospital staff (and some of my horsey friends). Of course The Saint said sure, and we battled a strong, cold wind to walk the six blocks from my son’s apartment to the Vogel store. I’d heard that Vogel discounts its rejects, but I didn’t really think they’d have anything to fit me since I border on midgethood. I was toying with finally indulging my 40-year whim and ordering custom. I was fast approaching 60 and what better way to celebrate than realizing one of my few remaining equine dreams (got the farm, got the horse, got the horse trailer, got the trainer). It might be time to cross that line. I’d proven to myself that I could be patient. If this were a movie, there would have been a beautiful Monarch butterfly flapping and drying its exquisite wings on the iron rod of the old Vogel sign in slo-mo, with sappy music. But this was no movie and being the middle of December, all the Monarch butterflies were in Mexico. To my utter joy, the last pair of orphans Dean Vogel brought out for me to try were ordered by my doppleganger, and they were exactly the boots I would have designed. I threw my arms around him, teared up (OK, so I also cried during the Super Bowl’s Budweiser commercial) and thanked him for making a 40-year dream come true. He looked a little befuddled, but happier than he’d been when talking about his kids in college. I’d proven to myself that there is hope for us butterfly killers. I know I can watch patiently as they unfold. And I can wear my new Vogel boots doing it.